Regular_White_Square_Envelopes is rated 4.6 out of 5 by 23. Rated 5 out of 5 by EBD57 from Incredible Company! Incredible find! I looked everywhere for 4.5 X 4.5 inch envelopes. This is where I found them! They are PERFECT for my card needs! I only wish they came in other colors. Rated 5 out of 5 by Claire from So glad I found these little envelopes. Again, I am so happy I found these 3x3 envelopes. Thank you. Rated 5 out of 5 by Itsabridalthingtoo from Perfect Size I love the different sizes available. This was a unique project and the size of the envelopes were perfect to fret it done. Although, pricing could be a little I will order again! Rated 5 out of 5 by Bflo from Good quality Good customer service. Good quality envelopes at a good price. Rated 5 out of 5 by Kmille from Perfect for my needs Have been using JAM Paper for years. Never a disappointment. Rated 4 out of 5 by RJ19 from Custom Business Cards We needed to make creative business cards for one of my classes. These envelopes came in the absolute personal size and are very sturdy despite their small size. I only wish we could get custom designs printed on them. Since we can't, I had to spend an extra $16 on square stickers. 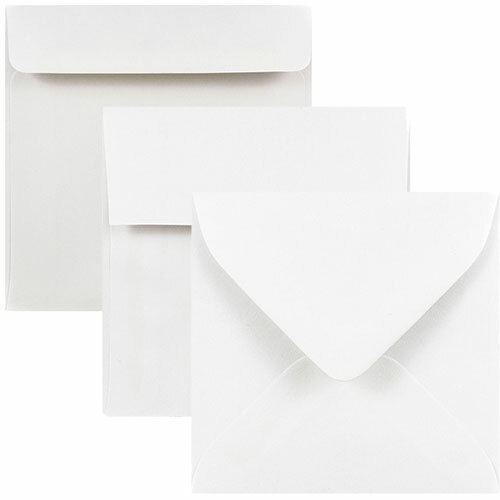 do you have white cards fit inside these envelopes? Do you have 4000 of 3992315 8x8 square envelopes white in stock? Yes we do! Please check your email for further details. Hi there. May I ask what does &quot;not mailable&quot; mean? I'm looking for envelopes that fit a 4x4 card and see your 4.5x4.5 envelopes, but I need to mail these. Any recommendations? Thanks. The smallest size mailable is 3 1/2 x 5 inches, so it does not fit the size for usps requirements. I would go with a larger size, either A2 or 5x5 square. Hope this helps! What brand paper are envelopes made of? Hello! These envelopes are Mohawk Paper. Thanks for the question! Hi there...do you have a 3 x3 square place card to go with the square envelope? is it possible to get a sample of the card and envelope? Yes, they are acid free. Hope this helps! Hello! Check out our Strathmore Natural White Wove 3 1/8&quot; x 3 1/8&quot; envelopes - https://www.jampaper.com/ecom/index.asp/show/detail/cat/52/prd/20/c/1232/s/168. They are more ivory than the others. Thanks for the question! Do you also sell these small square envelopes with inserts? Unfortunately we do not have these envelopes with inserts. Sorry for any inconvenience this may cause. Don’t let the name fool you, these are anything but regular. But square, well we can’t say no to that. And we don’t think it’s a bad adjective anyway. Actually, we never figured out why being ‘square’ is such a bad thing. Especially when it involves envelopes. So embrace your inner nerd (or ‘square’ personality) by picking up one of these! Square envelopes are inherently unique, especially looking at them next to that simple, standard envelope. So when you want to stand out, go for our square envelopes and make that square factor become back in style. Because rectangles are SO last year. And the pure, white color will match any kind of announcement, greeting card, and all of those hard to fit invitations. Whether you want to compliment your ivory invite or contradict that black invite, the white will match! Available in over 15 sizes so that every occasion is accounted for. These white square envelopes are made from 28lb stock.